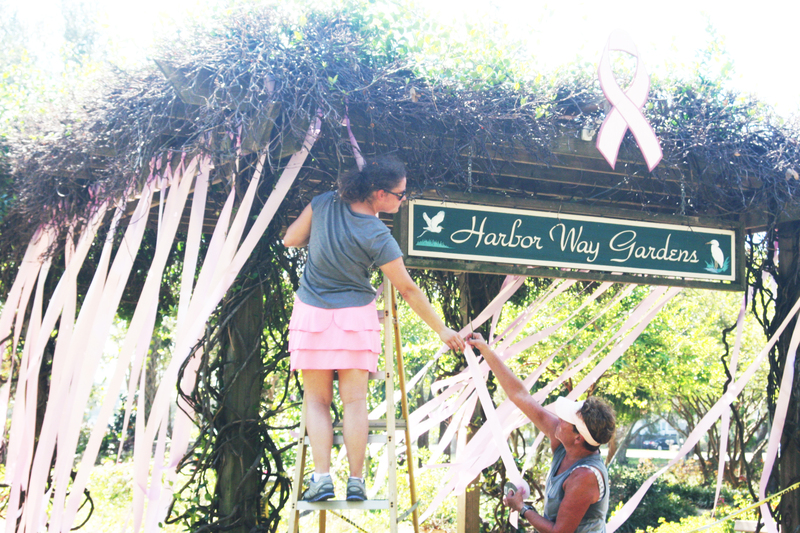 Kati Running helps her mother, Elise Running, hang pink ribbons on Harbor Way Garden on Wednesday, Oct. 3. With as many as 20 trees downed, the Wrightsville Beach Harbor Way Gardens saw extensive damage from Hurricane Florence, forcing officials to close the gardens to visitors and altering plans for events there in the future. However, members of the Harbor Island Garden Club, which maintains the public gardens at the footsteps of Wrightsville Beach, said the destruction will offer a chance for improvements, while vowing the gardens will be ready for the April 2019 Azalea Festival Garden Tour. Because several uprooted trees blocked the walkways in the garden, town officials have closed it until it is repaired, Running said. In the meantime, members of the Harbor Island Garden Club will be seeking donations to help repair the garden. One of the most immediate outcome from the storm’s damage is the modification of the annual pink ribbon tree at the garden. In the past, the Harbor Island Garden Club has written names of those who battled breast cancer on pink ribbons that would dance in the wind from a tree in the garden. However, that tree had a damage limb, which along with the garden’s closure, made it impossible to hang the ribbons this year. Instead, garden club members hung several pink ribbons from the garden’s entrance way, which Running said would still raise awareness of breast cancer while also showing continued support for those fighting the disease. “With the hurricane, it’s the best we can do this year,” Running said. The damage to the garden will present the club with plenty of work, she said, but there will also be some opportunity to make improvements to the garden, which she believed would be open again in two months. “It gives us an opportunity to plant more things,” she said. But there will have to be some changes. For instance, many fatsia plants, which grow in the shade, are now exposed to the sun and will need to be moved. Several of the stumps will needed to be grinded down as well. And while there have been many offers for people to help, Running said that due to liability reasons, only the town could schedule labor for the site. In addition to monetary donations, the club could accept other donations on behalf of the garden, including replacement benches for two that were destroyed by the storm. Other elements of the garden came through intact, Running said, including the lighting and irrigation system. In another stroke of good luck, two picnic tables that were to be installed in the garden had not yet arrived before the storm. Running said she had her first chance to see the garden on Wednesday, Sept. 19, when the general public was allowed back on the island.